Why would on earth people wants to embark a long Komodo tour journey and get dangerously close to the man eating, venomous Komodo dragons? Well, obviously not to catch the dragons to their Poke-ball—that’s for a cartoon movie. The answer is none than Flores’s upmost beauty that has captured the hearts of many travel junkie. Ever since it joins as New 7Wonders of the World, this UNESCO-protected continues to let out new destination gems. Now the secrets has seeping out, travelers are having wider options for their Komodo tour. Today, it has extend vast beyond the dragons’ territory. People are no longer flocking to this southeast frontier just to see the scaly beast flicking their forked tongue. They are all prepared to discover the underwater beauty, visit all the islands, and go into deeper exploration through Flores’ rolling hills. So, basically there are three modes to go on a Komodo tour that you would love—regardless the length of the tour. What are them? Check out below. Island excursion is the most common type and one of the most basic Komodo tour offered by operators, though not less fun. In this trip, you are going to visit the dragon lair, Komodo Island and Rinca, and explore the surrounding islands. Prepare your hiking shoes, as you will do lots and lots of hiking in the barren and jagged islands! 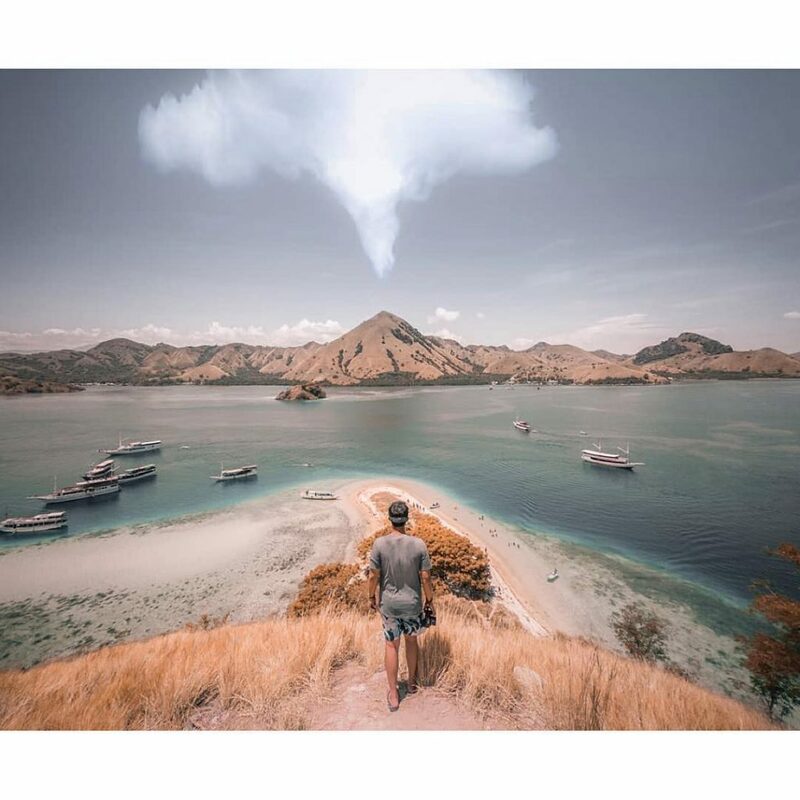 Some important highlights to not miss are the panoramic hills in Padar islands, wildlife sunset with bats in Kalong island, the pristine Kelor and Kanawa island, and of course, the world-famous pink beach. All of the destination are reachable both by speedboat or Komodo phinisi Liveaboard, though we strongly recommend the latter. Sailing with the liveaboard allows you to enjoy the scenic route and relax in between the island exploration. This type of travelling appeals to almost everyone, even to non-diver travellers. The world under the water around the Komodo National Park are benefitted form the land’s protection status, allowing the coral triangle region to bloom into its maximum potential. Ever since the discovery of Komodo Island, divers begun to explore the marine life and spread the amazing view to the world. As expected, diving and land exploration become one of the most famous Komodo tour package to sell. During the excursion days, you are going to go into two-world explorations. Half of the days will be spent submerged under the water, scuba diving around lively gardens of corals and school of fishes. And when you are not busy catching sharks, you are going to spend the days in the middle of Komodo’s crisp savannah and sparkling beaches. Some diving enthusiast choose fill their trip entirely with diving. While diving trip is absolutely fun, it might be a loss to just miss the beautiful panoramic landscape. Try to visit some islands if you can! Some diving sites that can be the highlight are Manta Point, Castle Rock, Crystal Rock, Batu Bolong, Golden Passage, and Tatawa. Many travelers arrive in Labuan Bajo, Flores, just for gateway before launch themselves to the Komodo National Park. However, it’s best to give the mainland Flores a try before going back to your homeland—and it won’t disappoint you. Flores hides so many natural gems behind the rolling hills. Clear waterfalls, mirror-like lake inside a cave, and a preserved ancient tradition dating back to the stone age. Some of Flores’ best destination are Cunca Rami Watrefall, Rangko cave, Kelimutu Mountain, Wae Rebo village, and Bena village. And it’s absolutely a must to see stunning Ikat weaving during your village visit! Not many operators offers the complete version of Komodo tour like this, but if you find one, you know you’ve stumble to the right one! So, have you find the ideal Komodo tour for you?